ASLMA-154 | Size: 50 ml / 1.69 fl.oz. With global anti-wrinkle, UV, urban and electronic anti-pollution actives, the moisturizer works to reduce wrinkles and fights the signs of aging. 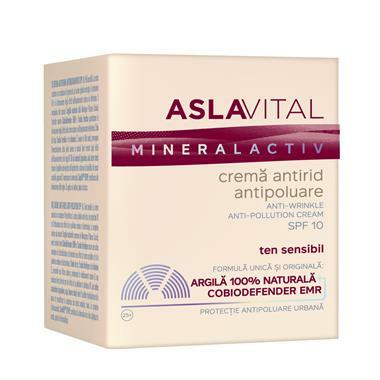 Shields from the environmental damage, adds vitality and nourishment to the skin. Natural Oils Complex (soy, squalane, shea butter) – Nourishes, promote suppleness and restores the hydro-lipid skin balance. INGREDIENTS: AQUA, CETEARYL ALCOHOL, GLYCERIN, GLYCERYL STEARATE, ZINC OXIDE (NANO), GLYCINE SOJA OIL, ETHYLHEXYL METHOXYCINNAMATE, ETOXYDIGLYCOL, UNDECANE, HYDROXYETHYL ACRYLATE / SODIUM ACRYLOYLDIMETHYL TAURATE COPOLYMER, PHENYLBENZIMIDAZOLE SULFONIC ACID, OLUS OIL, PHENOXYETHANOL, DIPALMITOYL HYDROXYPROLINE, TRIDECANE, ISOHEXADECANE, DIMETHICONE, TRIETHANOLAMINE, CETEARETH-22, TOCOPHERYL ACETATE, TITANIUM DIOXIDE (NANO), BUTYROSPERMUM PARKII BUTTER, MAGNESIUM ALUMINUM SILICATE, POLYSORBATE 60, FERULIC ACID, METHYLENE BIS-BENZOTRIAZOLYL TETRAMETHYLBUTYLPHENOL (NANO), PERFUM, TETRASODIUM EDTA, DIMETHICONE CROSSPOLYMER, TRIETHOXYCAPRYLYLSILANE, ETHYLHEXYLGLYCERIN, PEG-40 HYDROGENATED CASTOR OIL, SORBITAN ISOSTEARATE, BHA, ALUMINA, DECYL GLUCOSIDE, ORYZA SATIVA BRAN OIL, GLYCOGEN, CALENDULA OFFICINALIS FLOWER EXTRACT, SIMETHICONE, SODIUM HYDROXIDE, PROPYLENE GLYCOL, TOCOPHEROL, XANTHAN GUM.